The teaching of Islam as regards anyone committing wrongdoing or harming another whether in a slight or extreme manner is inclined towards reformation. Concept of punishment is indeed there but it is in conjunction with commandment of forgiveness and pardon just as the aforementioned verse shows. The pivotal point being that any punishment should result in reformation of the wrongdoer. With reformation as the main objective, before deciding on punishment it should be considered whether it will result in it or not. If reformation is deemed to result from pardon then that should be the option otherwise punishment should be decided on. Forgiveness makes one recipient of Divine reward. And the aforementioned verse ends in clarifying that if excessive punishment is meted out it will be unjust and cruel. This concept of forgiveness and punishment is at the foundation of fairness in individual, communal and indeed international matters. The real objective of punishment being reformation and moral betterment, Islam teaches to keep in view that emphasis is not only given to punishment, rather it is designed towards reformation. Any punishment given should be in accordance with the crime and if meted out disproportionately, it incurs God’s displeasure. The most excellent examples of this are found in the blessed model of the Holy Prophet (peace and blessings of Allah be on him). In instances where he felt reformation had taken place he forgave even the bitterest and cruellest of enemies. When the guilty person showed remorse and regret, the Holy Prophet (peace and blessings of Allah be on him) forgave those who had perpetrated grievous cruelty towards him, his family and his Companions. Hazrat Zainab (may Allah be pleased with her) the Holy Prophet’s (peace and blessings of Allah be on him) daughter was brutally attack during migration. She was expecting at the time and was wounded and miscarried and later her injuries proved fatal. The perpetrator was given the death penalty but he fled. Later, when the Holy Prophet (peace and blessings of Allah be on him) returned to Medina he came to see the Holy Prophet and explained that he had fled out of fear, he acknowledged his heinous crimes but said he had come after learning of the clemency of the Holy Prophet (peace and blessings of Allah be on him). 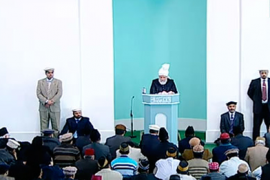 He acknowledged the ignorant ways he had followed and accepted that God had sent the Holy Prophet for guidance. He confessed his crimes and sought forgiveness. The Holy Prophet (peace and blessings of Allah be on him) forgave him and told him that it was a favour of God on him that he was enabled to accept Islam and repent sincerely. Ka’b bin Zuhayr wrote vilifying poetry about Muslim ladies attacking their honour. He was duly sentenced. After conquest of Makkah his brother wrote to him asking him to seek forgiveness of the Holy Prophet (peace and blessings of Allah be on him). He came to the Prophet’s Mosque at Fajr time and offered Salat in the company of the Holy Prophet (peace and blessings of Allah be on him). Without introducing himself he put it to the Prophet that Ka’b bin Zuhayr wished to seek pardon for his past wrongdoing and whether he could be presented or not. The Holy Prophet (peace and blessings of Allah be on him) agreed. This is when he said that he was Ka’b bin Zuhayr. A Companion got up to kill him when displaying amazing compassion, the Holy Prophet (peace and blessings of Allah be on him) said leave him, he is seeking pardon. Later, Ka’b bin Zuhayr presented a poetic eulogy to the Holy Prophet who gave his cloak to Ka’b as a gift. There are indeed many incidents in the blessed life of the Holy Prophet (peace and blessings of Allah be on him) where he forgave personal enemies, enemies of his close relatives and enemies of Islam who had reformed themselves. However, he gave punishment where he considered punishment was needed. The core of the commandment in Islam is reformation and not seeking revenge. ‘The recompense of an injury is a penalty in proportion thereto; but whoso forgives and effects thereby a reform in the offender, and no harm is apprehended, that is to say, exercises forgiveness on its appropriate occasion, will have his reward with Allah. People who were pardoned by the Holy Prophet (peace and blessings of Allah be on him) had clearly changed. Once reformed, enemies of Islam who committed wrongdoings became pious and served the religion of Islam. Islam convinces the significance of its commandments is every age. It endorses to take that action which is in the best interest of the perpetrator. Today the champions of human rights have taken a stance which leans to one extreme. No matter how grave a crime, in the name of human compassion criminals are given free rein and many have lost any sense of wrong. These could be contract killers and people who have no regard for anyone. They should be given the death sentence unless in situations where the victim’s family pardons. However, the Western world has amended its laws and has abolished the death penalty in the name of human rights. Yet, while reformation does not take place, crime is on the increase! Conversely Muslim heads of state have been deposed and rather than take legal recourse to bring them to justice, local people have been used to kill them mercilessly. When local people act in this way they have the backing of other powers. The Promised Messiah (on whom be peace) wrote: It is written in the Gospels not to contend with evil. The teaching of the Gospels is inclined towards extreme leniency and cannot be put into practice with the exception of specific situations. On the other hand the teaching of Torah is inclined towards the other extreme. It only stresses on one aspect, that of an eye for an eye, an ear for an ear and a teeth for a teeth. It does not even mention pardon and forgiveness. Fact of the matter is that these Books were meant for a specific period and for specific people. Whereas the Holy Qur’an has shown us a pure way which is free of the two extremes and is in exact accordance with human nature. For example the Holy Qur’an states: ‘And the recompense of an injury is an injury the like thereof; but whoso forgives and his act brings about reformation, his reward is with Allah….’ That is, recompense of an evil committed should be proportionate, but if there is to be pardon, reformation should be the underpinning aspect in that forgiveness. And the forgiveness should not be inconsistent as regards time and place and should be apposite. A person who forgives in this manner will be rewarded by God. Islam teaches that if you forgive someone you should not have any malice toward them. During the Battle of Uhad, wife of Abu Sufyan Hind committed extreme barbarity. She mutilated the body of the Prophet’s uncle Hamza and gouged out his liver and ate it. On the other hand, after the conquest of Makkah, Hind came into an assembly of the Holy Prophet (peace and blessings of Allah be on him) with her face covered. She took bai’at and became Muslim. The Holy Prophet recognised her voice and asked her if she was the wife of Abu Sufyan. She answered that she was but she had accepted Islam with a sincere heart and asked that what had happened in the past be forgiven. The Holy Prophet (peace and blessings of Allah be on him) forgave her. Hind’s life transformed. She sent the Holy Prophet (peace and blessings of Allah be on him) two roasted goats with the message that her herd was not very large at the time so she was sending little. The Holy Prophet (peace and blessings of Allah be on him) prayed for her and her herd increased tremendously. The administration of the Jama’at and the office-holders should keep these matters in mind. Relevant departments should try and make recommendations and reach decisions after due consideration and deliberation and ultimately base them on what pleases God. Help should be sought from God through prayers followed by recommendations made to the Khalifa of the time so that the complainant as well as the administration of the Jama’at remains protected against any harmful effect. If someone hurts you, for example, breaks your tooth or gouges your eye, the punishment is in proportion to the evil committed. However, if you forgive the sin with the view that it results in something good leading onto reformation, for example the perpetrator desists from such acts in future, then pardoning is better and the reward of this will be with God. In summer the clothing here [in the West] especially those of women becomes extremely scant while in winter they wear coats and scarves. When Muslim women wear the same kind of scarves to cover their heads in summer it is said that they are being oppressed. Now the Government has started interfering in this regard and the objective is not reformation but it is unfairness and unjust. Recently the Prime Minister said that they are considering to take action against women who cover up in public places or at work place. The worldly laws are being taken to the other extreme which will create disorder and restlessness. Islam speaks against decisions which create disorder and restlessness and states that decision should be based on attaining betterment of individuals. Bilal Mahmood Sahib was martyred in Rabwah on 11 January by two unknown assailants on motorbike who fired at him as he walked home in the evening. Bilal Sahib was born in 1989 and was a Waaqif e Nau. He was currently working at the Wasiyyat department. He was married in April 2015 and his wife is expecting their child. Bilal Sahib leaves behind his widow, mother and a brother. May God elevate his station and grant steadfastness to his family.